This fall Banana Republic is celebrating its 35th anniversary this year, and their 2013 Fall and Winter collection was overseen by the label's new design advisor, Narciso Rodriguez. Rodriguez took up the advisory role last year and is working alongside the brand’s executive vice president and creative director Simon Kneen - and they have come out with some very smart, classic and popular looking silhouettes. The collection’s color palette is decidedly bold, as there is ample use of cobalt blue in one of the lines, which can be easily paired up with items from the second line, that features a number black and white garments. 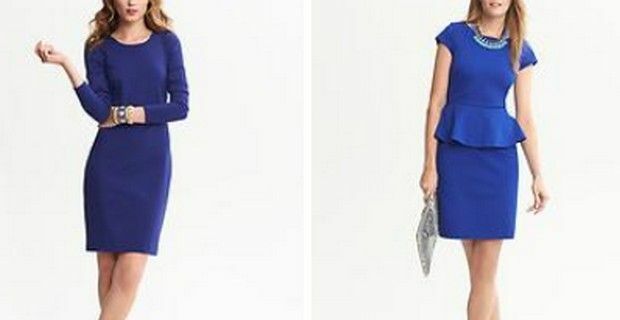 The Cobalt Blue line contains a pair of figure flattering ponte dresses that can be worn all season long, but there are also separates like the Martin fit, mid-rise wool trousers and a pencil skirt with a vented front hem. Also available are peplum style tops, a scalloped lace tee and more casual style t-shirts, all in shades of blue, color blocked or in prints. Banana Republic also concentrated cobalt blue on some of their accessories: with handbags that range from totes, satchels, to crossbody styles, but there are also belts and jewellery. The Black and White collection however, has more to choose from in the way of smartly styled dresses. You can find the peplum style also in this line-up – which the brand seems to particularly favor this season - along with shift and flared styles. There a casual wool coats and jackets, several with the BR monogram, while there is much vaster array of t-shirts and tops in a number of different styles and prints, from striped to sequined. For the colder autumn days Banana Republic also has sweaters and cardigans, but if you feel that fashion has to be a little edgier, you should definitely check out their Leather to Love collection.